In international development, there is a romanticism that comes with working in the field. There’s satisfaction in waking up to a golden African sunrise, in beholding the beautiful red dirt roads of Uganda. 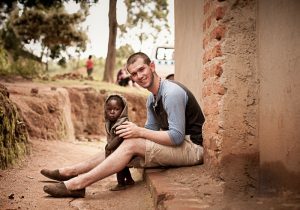 As a part of Team #18 in May 2014, I experienced life in Ugandan communities, standing shoulder to shoulder with amazing men, women, and children – and it shaped who I am, changed my worldview, and forced me to re-examine my values. Such fieldwork is critical in creating meaningful success in international development. It also happens to be the most visible facet. Such success, however, cannot be achieved without critical work on the back end. While there are no African sunrises or rolling red dirt roads in my internship, no photo shoots generating funding or emotional responses from friends and family, it is a story that I have been asked to share. In the business of charity, good intentions are not enough, helping can hurt, and charity can be toxic. It is humbling to know that, despite our best efforts to do good, we can be inflicting long-lasting harm without knowing it. For me, monitoring and evaluation (M&E) is an essential part of going beyond good intentions and avoiding these pitfalls. M&E supports both responsible giving and responsible receiving. It celebrates our best efforts and humbles us before our worst failures. 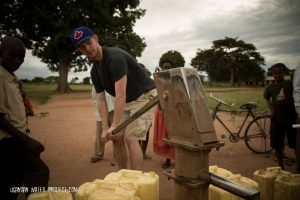 For these reasons, I was elated when James Harrington, Executive Director of the Ugandan Water Project (UWP), expressed interest in an M&E program to help effectively provide communities in Uganda with safe drinking water. James proposed that I come on board as a summer intern to lay the groundwork for their M&E effort. With only 2 years of undergraduate studies at Houghton College, I was not expecting to be assigned such a paramount position. Interns are supposed to input data, not design the surveys and develop the management plans, right? Sure, I had some past experience: completing M&E research and observing field data collection in Ecuador for Medical Assistance Programs (MAP) International, but by no means was I expecting to lay the groundwork for an entire M&E program! Even still, James entrusted me with the position and I was happy to oblige. Early on, I was a bit overwhelmed. My task was to research and then outline an M&E program customized to UWP’s needs and then propose next steps. I came with a general knowledge of the M&E process from my research for MAP International, but taking that knowledge and creating a custom program to fit UWP required hours of digging. As I came to discover, it is quite difficult to find M&E information specifically on the Water, Sanitation, and Hygiene (WASH) sector for smaller organizations like UWP. I had to go straight to the source, which meant contacting other WASH organizations directly. Throughout the first week of my internship, I compiled a list of around one hundred WASH organizations. I then sent emails to development professionals, compiling indicators that WASH organizations are using to track outcomes in the field, and organizing these indicators into three levels – process, outcome, and impact to parallel UWP’s Theory of Change outlined in their Logical Framework. Through this process, I gained a great deal of knowledge. I am especially grateful for the professionals who took time away from their organizations to talk with me by phone, helping me to understand the M&E process from a WASH context: Alex of The Radler Foundation, Mark with Ryan’s Well, Lindsay with Lifewater, Laura and Sarah from The Water Trust, and Ryan from Healing Waters. Thank you. 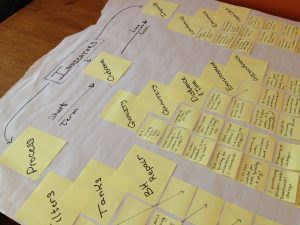 Now it became evident that UWP needed a data analysis system that suited its unique needs and capacities as an organization. We needed a platform to customize surveys, upload survey data to analyse and disseminate, tag GPS points, and to collaborate from and share information between stakeholders in the WASH sector. While finding all of these characteristics in a single platform seemed unrealistic, we held out hope. 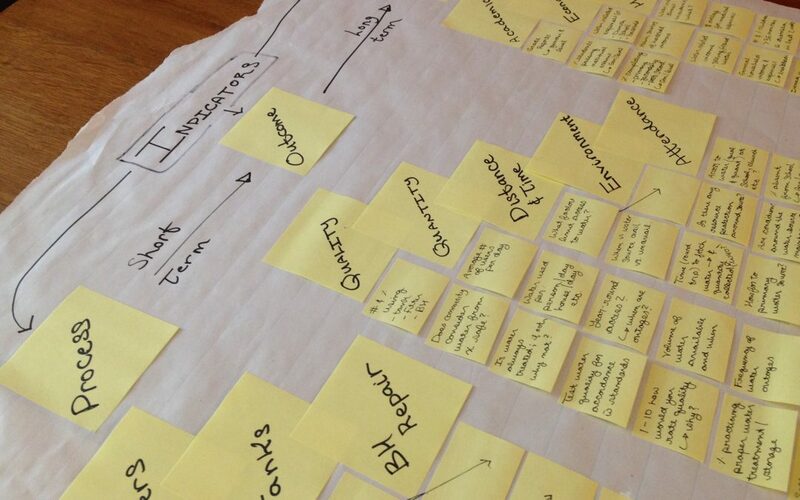 With many organizations holding similar needs and values to ours, a product must already exist. Several products held potential. In the end, it came down to two: Akvo and mWater. I first found Akvo, a company that designs data collection and analysis technology for international development organizations. I discussed Akvo with other organizations and received positive feedback. With complete confidence in Akvo’s capabilities, I excitedly showed the product to James. While James thought the product was okay, he told me to keep looking. At the time, this frustrated me; I was convinced I had found our solution. Why waste more time? Despite my frustrations, I kept looking. The next morning, I came across mWater in a CARE International document and decided to look into it. 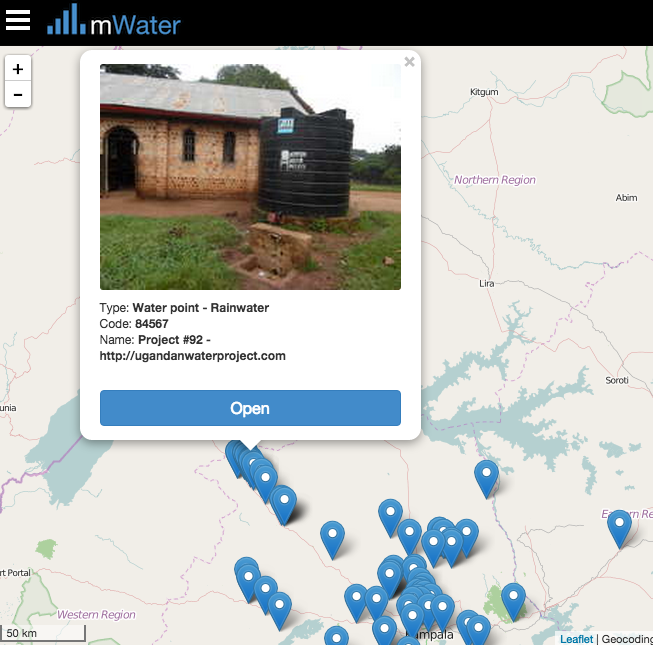 MWater offers the same services as Akvo without the hefty annual fee and is geared toward WASH organizations, equipped with a data-sharing platform that maps water points all around the world! James squealed like a little girl when I showed him the platform and its capabilities! Within a week, we talked with one of the founders, discussing what mWater could offer UWP. We now knew there was no better option: mWater offered the services we were looking for and was founded upon values we share. At this point, I had determined indicators, found a data collection platform, and I felt confident in my understanding of the M&E process. I knew the types of questions our surveys needed and had other organizations’ surveys to help. Next, we had to turn these indicators, questions, and our new-found mobile data collection platform into something usable. With a team embarking for Uganda in the coming week for fieldwork, we capitalized on the opportunity to test drive our survey. I developed a rough data collection form to send with the team. As our team conducted surveys in Uganda, results began to trickle back. Certain aspects of our survey did not work, as expected. While language and culture barriers obscured some questions, others were too ambiguous to be asked in the field, leading to unusable results. While I was disappointed to see our survey fall apart, it was exactly what we needed. Now we had a better idea of what worked and what didn’t. It was time to analyze, time to learn, and time to improve. After analyzing the results of our initial survey, I was able to formulate better questions. I then turned our paper survey into digital format on mWater. The survey became simpler as the technology allows for skip logic. Numeric responses, textual responses, checklists, radio button responses, and photographs can all be collected in a single form. Best of all, with the mWater mobile app, data collected on site uploads straight to the online portal where it can be approved and analysed. All of our data can be centrally stored, and changes in indicators can be tracked over time and across all UWP sites. Following the team’s return from Uganda, more draft surveys have been tested. We are taking it one step at a time to ensure our Ugandan staff understands before bringing in mWater. Part of the learning process has been adapting to: appropriate survey length, wording that Ugandans respond to well, and removing culturally inappropriate questions. I could not have made progress without the feedback, guidance, and support of our Ugandan staff that understands cultural dynamics better than I ever could and will ultimately be using the program in the field; their help in the process has meant the world to me. In preparing to hand off my body of work, I composed M&E management materials that will assist in implementation, created a Causal Analysis Framework, offered revisions to UWP’s Logical Framework, and – my proudest accomplishment – designed an Indicator Matrix for M&E system management. I compiled documentation for focus groups and tracking empowerment through personal and community stories. All the crazy ideas that have been in my head for the last seven weeks, all of the basic knowledge and understanding of M&E, are now able to be used by the UWP staff. As this journey has come to an end, I have found myself reflecting on my time with UWP. I have never poured myself into a single project like I have here. It has truly been a blessing to fully commit myself to the design of this program – a task that I have grown to love. I have lived a dream this summer: I designed an M&E program for an international WASH organization working in East Africa. Somehow, I was able to do it all as intern! My time here was far too short, but the impact has been lasting. I have become part of the Ugandan Water Project and UWP has become a part of me. Read Tanner’s full story here. Great article Tanner!! Love the pictures. Hope all is well. Cathy Meyers -your neigbour -now volunteers — sent me the link.